The field of zoology has many notable names with some of them dating back several hundred years. However, there are also more modern zoologists that have managed to make contributions to the field that the world will not soon forget. One zoologist that has managed to make a difference and raise awareness is a Steve Irwin. While he may be more known as a TV personality who wrestles crocodiles on TV and featuring different animals, Steve Irwin was also a zoologist, a naturalist, and a conservationist. He was more than just a guy in khakis playing with animals on TV so get to know more about Steve Irwin and his work. He left the world too soon by means of a freak accident but he will be remembered forever. Steve Irwin was born in Essendon in Melbourne on February 22, 1962 and shared the same birth date with his mother. His parents were Lyn and Bob Irwin and they moved to Queensland in 1970 when he was still a child. He went to school at Landsborough State School and for high school he attended Caloundra State High School. It really is not surprising why he became interested in animals because according to Irwin his father was a wildlife expert that had a huge interest in herpetology while his mother Lyn worked as a wildlife rehabilitator. In fact, when they moved to Queensland his parents started a modest-sized park known as the Queensland Reptile ad Fauna Park. Young Steve Irwin grew up in the company of not just crocodiles but other types of reptiles as well. Steve Irwin was involved in the running of the park and was involved in several aspects of how it was run. He not only took part in the daily feeding of their animals but he also made sure they remained in good health and maintained the park facilities. While most young boys got bicycles or other toys for their birthdays, he was given a 4m long scrub python and by the time he turned 9, he was already handling crocs like a pro and wrestled his first crocodile under the watchful eye of his father. As he grew older, he did volunteer work for the East Coast Crocodile Management program in Queensland where he helped catch over 100 crocs. Some of the crocs where transferred to his family’s farm while others were relocated. He would spend months at a time looking for wayward crocs before they were hunted so he could relocate them to safer areas and all this he did with the help of his dog, Sui. It was in the year 1991 when Irwin met a naturalist from Oregon named Terrie Raines and she was to become his wife. It started out innocently enough with Raines visiting Australia to check out wildlife rehabilitation facilities and decided to pay a visit to Irwin’s zoo. According to them, it was love at first site and after a four month engagement they got married in Eugene, Oregon. They have two kids; the eldest is a girl named Bindi Sue Irwin and little boy named Robert Clarence Irwin. The girl was named for Irwin’s favorite animals and his dog while the little boy was named after Irwin’s dad. It has been said that if Irwin was enthusiastic about his animals, he was doubly in love with his family and kids. The Irwin’s were a happy family and made a great couple but they did not wear rings since they believed the rings could pose a danger to themselves and the animals they handled. Instead of going on a honeymoon as average couples are wont to do, the Irwin’s decided to trap crocodiles together and the footage they took during their honeymoon became the very first episode of Irwin’s hit show the Crocodile Hunter. The show debuted on Australian TV in 1996 and slowly made its way to the US, the UK, and 130 other countries and was enjoyed by more than 500 million people. As a host, Irwin was personable and exuberant and his broad Aussie accent just made him that much more appealing. Pretty soon, the Australian TV host not only had a signature catchphrase (crikey!) but also had a signature look that always consisted of a shirt and khaki shorts. Sir David Attenborough heaped praise on Irwin saying that he was a natural born communicator and taught people of all ages just how wonderful and exciting Mother Nature was. After the last episode of The Crocodile Hunter aired, Irwin went on to star in other Animal Planet shows and documentaries some of which are: Croc Files, New Breed of Vets, and The Crocodile Hunter Diaries. 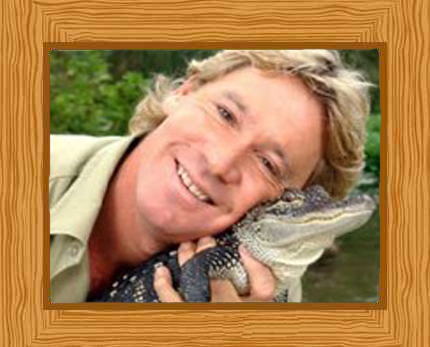 Someone who loved the wild and animals and worked hard to promote the environment deserves awards and Steve Irwin got a lot of them. In fact, he even has a turtle named after him while he discovered it during a fishing trip. He called it the Irwin’s turtle or Elseya Irwini. An air-breathing type of snail that was found in Australia was also named after him and it is known as the Crikey Steveirwini. He was granted awards in Australia and other parts of the world for his conservation work. He was even nominated for the Australian of the Year Ward at one point. Steve Irwin did not fear animals but he had a healthy respect for hem and what they were capable of doing. This is why what happened in September 4, 1996 so shocking. He was snorkeling in Batt reef when he was hit in the chest by a stingray which brought on his death. It is believed that his is the first and only ever death by stingray that was captured on film. All copies of the film were destroyed at the request of his family. He is survived by his family and his legacy to protect nature and take care of animals is something that his kids and wife are doing their best to continue.